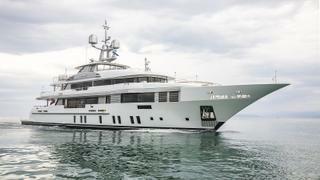 Benetti has delivered the 49 metre displacement yacht Elaldrea+ during a ceremony at the yard’s Viareggio facility. The interior design meanwhile has been done in-house by Benetti’s style department. The main lounge has been split into a lounge and dining area populated with brands chosen by the owner including Poltrona Frau, Giorgetti, Softhouse and Arketipo. Accommodation is for a total of 12 guests in six cabins, comprising two VIP cabins and two double cabins on the lower deck, all of which include a private bathroom and shower. The owners’ quarters meanwhile sit on the main deck and are decorated with materials, including fine marble and wood. They also include two dressing tables, two bathrooms that share a central shower, a private balcony and an office. Crew accommodation is for a staff of up to 10 in five cabins, which include private cabins for the captain and chief engineer. Other key features include a seawater swimming pool on the upper deck and a second panoramic fresh water swimming pool on the sun deck. Elaldrea+ is powered by a pair of MTU 12V engines for a top speed of 14 knots and cruising speed of 13.5 knots.